This short bonus ebook tells June's story, a true account of a woman who crossed the Atlantic for love after the Second World War. June noticed an American soldier walking towards her ... In the drab setting of the churchyard he looked utterly out of place, as if a movie star had just dropped out of the sky. Raised in Birmingham, June marries a handsome GI called Borgy and looks forward to a new life in America. But when war ends, June is horrified to receive a letter from her husband telling her they are moving to Germany instead. June's life soon takes a shocking turn. 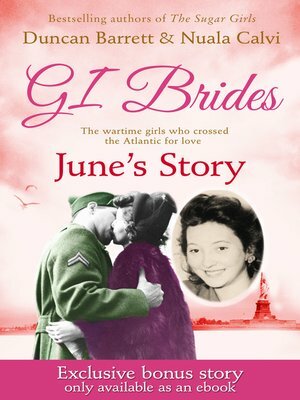 June's story is an additional extra to the four tales in GI Brides, written by the bestselling authors of The Sugar Girls. It tells the true story of one of the 70,000 British women who crossed the Atlantic for love after the Second World War. Nuala Calvi co-authored The Sugar Girls and has been a journalist for eight years with a strong interest in community history pieces.